The 10th annual Symposium on Simulation for Architecture and Urban Design (SimAUD) offers a platform to unite researchers and practitioners in the ﬁelds of architecture, urban design, urban planning, building science, and data science. SimAUD 2019 invites submissions across a range of topics related to simulation with a special emphasis on methods that bridge disciplinary gaps between design, construction, operations, resource management, human behavior, and performance analytics across building and urban scales. This year we celebrate 10 years of SimAUD at Georgia Tech in Atlanta GA, USA. In past years, attendees have included researchers and practitioners in the fields of urban planning and design, architecture and building science, visualization and construction, as well as software developers, managers, educators, and business professionals. Past SimAUD symposia have attracted exceptionally high-quality submissions (papers, notes, works in progress, datasets, and videos). We highly encourage you to take advantage of the free downloads of previous years’ proceedings. SimAUD is run collaboratively with The Society for Modeling and Simulation International, (SCS) and is cosponsored by ACM/SIGSIM. The abstract submission should be a short paragraph describing the topics to be covered in the full submission. Abstracts are optional. They will NOT be reviewed and are simply to help the committee recruit the number of reviewers needed in the appropriate sub-disciplines. This is the date when papers (archival format, 8 pages maximum for short papers), projects, and accompanying videos must be submitted. The review process will be double blind. Authors will present their works at the venue in Atlanta, GA, USA during the Symposium on Simulation for Architecture and Urban Design. We invite you to submit and present an original contribution for SimAUD2018. All submissions are peer-reviewed and considered for selection by the Scientific Committee. All accepted full papers (8 pages) will be published in the ACM Digital Library. However, all the accepted submissions (both full and short papers) will be published in SimAUD’s proceedings. Please observe the submission types and deadlines on the website. Please adhere to the 8-page limit. Paper templates will be uploaded shortly. Short papers are non-archived publications (max. 4 pages) that present brief and focused research contributions that are noteworthy but may not merit a full paper. Typically short papers provide an overview of research-in-progress and/or thought-provoking work relevant to the SimAUD community. They have not reached completion level necessary for jury review and acceptance as complete papers; however, authors will benefit from in-person feedback from symposium attendees. Please adhere to the 4-page limit. Paper templates will be uploaded shortly. In order to help bring together diverse disciplines we aim to establish a common language of perspectives, case studies, techniques or technologies. One way to start this process is through invited works. The Committee may internally evaluate and invite certain papers, projects, or videos to include in the symposium outside the formal peer-review process. To nominate research that you believe would be beneficial to building this new community, please email any of the chairs with suggestions. Many architecture and urban design projects communicate visions of a proposed future. Projects and videos are among the best ways to communicate these visions. We invite project and video submissions of high-quality scientific visualizations of architecture or urban design projects, interactive design decision support systems, compelling animations of construction simulation, and more. We strongly encourage authors of full and short paper submissions to also provide a high-quality video for peer-review and exhibition at the SimAUD symposium. A project submission is a poster that summarizes a professional or student design project that utilizes simulation as a means for informing design decisions, in an effort to demonstrate innovation and excellence in architecture and urban design. All projects should be submitted on boards that adhere to an A1 page size, portrait or landscape orientation, with no other specific limitations and not necessarily tied to a paper submission. All papers that were accepted as posters should be submitted following the same format as the project posters. Accepted projects and videos will be featured in a poster session during the conference, and will be featured on SimAUD’s website. If you plan to provide a video or project, please notify the General Chair by email prior to the submission deadline. All abstracts and manuscripts must be submitted using the SimAUD 2019 Online Submission Site. We are pleased to announce that several workshops are being organized as part of SimAUD 2019. The workshops will take place on Sunday, April 7. The workshops will address the topic of simulation from a unique perspective and will offer hand-on learning opportunities on cutting edge computational approaches, workflows and tools. Workshops run for 3 hours (Half Day). Each workshop has a maximum number of participants on a first-come first-serve basis, and require a minimum of 5 participants to take place. If a workshop is cancelled due to non-sufficient subscriptions, participants can join one of the other workshops. For more information, please visit the SimAUD 2019 Workshop Web page. Description: During this one-day-workshop you will be introduced to methods for the analysis, synthesis and optimization of urban layouts. We will cover computational generation of the street network, parcellation and the building form, based on the existing urban context and various design goals. You learn how to analyze street networks effectively, and we show you how to compare and optimize the generated designs systematically. For this purpose we use Grasshopper for Rhino3D with the plugin DecodingSpaces-Toolbox, and a new Design-Space-Exploration tool. The methods are demonstrated by realistic case studies in an existing urban environments.This workshop is intended for both practitioners and researchers interested in rapid context aware generation of urban layouts. The presented workflow let you computationally explore the design options of new urban development area with the possibility to assess the site potential and inform the early planning stages. The presented DeCodingSpaces-Toolbox for Grasshopper is a collection of analytical and generative components for algorithmic architectural and urban planning. The toolbox is free software released by the Computational Planning Group (CPlan). Participants need to bring their own laptops (Windows) with Rhino 6/Grasshopper (there is a free 90 days test version you can use https://www.rhino3d.com/download ). In addition you need to install the DeCodingSpaces-Toolbox: http://decodingspaces-toolbox.org/. Description: The workshop will focus on digital technologies (AR/VR/MR) used to visualize designs and facilitate the interaction of humans and machines in designing, fabricating, and communicating the built environment. The attendees will be asked to help us imagine the future of design, fabrication, and construction through approaches tied to ongoing research at the Digital Fabrication Laboratory at Georgia Tech. We are keenly interested in the ways in which building design, and buildings themselves (materials, systems, processes) will be shaped by future technologies. We believe that this joint exploratory work has the potential to expand the way we envision the future inhabitation of cities — which will doubtless be shaped by these new cyber-physical orchestrations. Requirements: Workshop attendees will not need to bring computers but must wear appropriate shop attire for safety. 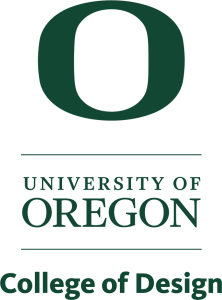 Description: This workshop will showcase a simple automated parametric methodology to make data driven early stage design decisions while optimizing for cost and energy. Participants will hear about successful application from the AEC industry using case studies and will have the opportunity to create their own optimization using cove.tool, guided by experts providing training, tips and advices. This would be a good session for all architectural practitioners, researchers and students that have the passion to use performance data to drive design decisions. Description: Design is a complex decision-making process. It is about the questions we ask and the decisions we make. To make decisions with confidence, multidisciplinary teams need to gather, weigh, and document rationale efficiently. This workshop introduces a framework of concepts and processes that support teams to construct and explore design spaces, understand and optimize conflicting objectives, and make performance-based decisions maximizing social, environmental, and economic value. Current parametric analysis methods can evaluate a large population of design alternatives. However, making a decision is not a simple task. While some alternatives have high performance in one objective, different alternatives perform better in others. In addition, stakeholders usually have different priorities. Such a combination of trade-offs and preferences requires a systematic post process to make decisions with confidence. Hardware: Laptop capable of running the below software with sufficient speed. Software: EnergyPlus, OpenStudio, Radiance, Daysim, Rhino & Grasshopper, JMP (trial) for statistical analysis, and selected plugins that will be sent to participants before the workshop. Previous knowledge required: Intermediate Grasshopper preferred. Some experience with performance analysis, and/or optimization is a plus. Description: What does it mean to have a new modeling software for design that allows designers to specify their actions by drawing shapes rather than by writing scripts? What is the difference between an object registered in your computer system and a shape you really see? What does it mean to program with shapes? For nearly four decades, the shape grammar discourse has described a different paradigm of design computing with the promise of revolutionizing computer-aided design (CAD). Its foregrounding of visual rules (shape rules drawn in a 2D or 3D modeling system) over symbolic rules (instructions defined in some programming language) has provided a robust theory for designers to believe in but nevertheless a formidable challenge to implement. This workshop will introduce the Shape Machine, a new visual programming software developed at the Shape Computation Lab at the School of Architecture, College of Design, in collaboration with the Schools of Mathematics and Interactive Computing at the Colleges of Science and Computing at Georgia Institute of Technology. In this workshop, you will learn to automate your routine drafting functions by drawing shape rules instead of writing code and reworking shape rules instead of debugging code. There are no requirements for this workshop. Description: Have you, in your practice or research, ever used a black-box, simulation-based optimization algorithm, such as a genetic one, or are planning to do so? Then this workshop is for you! The workshop introduces different kinds of optimization strategies for simulation-based problems, such as local and global search, metaheuristics, direct search, and [surrogate] model-based methods. The workshop presents recent benchmark results to guide which optimization algorithms to use when. The workshop focuses on single-objective optimization as a better-understood foundation but touches on—exponentially more difficult—multi-objective optimization as well. In addition, the workshop provides heuristics on how to formulate optimization problems, and how to combine several performance criteria into a single objective function, for example with penalty functions, weighted sums, and weighted products. The workshop is primarily intended as a theory session but might include short demonstrations and/or hands-on exercises in Rhino/Grasshopper. However, the workshop’s theoretical contents concern simulation-based optimization in general and thus relevant beyond specific software. Optional: Laptops with Rhino/Grasshopper, Goat, Silvereye, and Opossum. Description: Computational tools support architects and designers at various design phases. However, there is a clear lack when it comes to assembly planning as it takes usually only during the late stages. This workshop aims to introduce “Assembly Information Modeling (AIM)” as an approach to represent, simulate, visualize, communicate and optimize assembly processes. AIM is intended to be a general framework with which different stockholders (architects, engineers, constructors) analyze and communicate different assembly strategies and therefore enabling a large panel of purposes such as collaborative design on cloud-based platforms, robotic fabrication, augmented assembly and others.The participants of this workshop will learn:+ How to enrich building models with detailed assembly information. + How to generate an Assembly Digital Models from existing CAD models, such as Rhino3D. + How can algorithms be used to detect problems within the assembly sequences. + How cloud-based tools (e.g. Autodesk Forge) can be used for further processing and finally sharing Assembly model over the web. + How to use the digital model for detailed 4D assembly simulation. Windows 64 bits (Bootcamp on Mac is also fine), Rhinoceros 6 and Visual Studio Community 2017. Description: This workshop will walk through the steps required to simulate building daylight, electric lighting, energy flows and energy analysis optimization. Workshop highlights will include an overview of IESVE tools and applications. The attendees will then go into climate analysis and site solar analysis with IESVE. The different aspects of daylight illuminance, luminance, and daylight glare probability will be covered. Spatial daylight autonomy and annual sunlight exposure (sDA and ASE), the simulation option of LEED v4 daylight will be demonstrated. Developing a building energy simulation will include implementing internal gains and schedules in IESVE, improving building envelope, daylight harvesting with dimming (co-simulation), and incorporating renewable energy into the annual simulation. Requirements: IESVE Software is optional but is strongly recommended. Download a free trial from www.iesve.com/software at least 3 days before the training event. Software licenses are granted by email only. The conference will be hosted by the School of Architecture, College of Design at Georgia Institute of Technology (Georgia Tech). 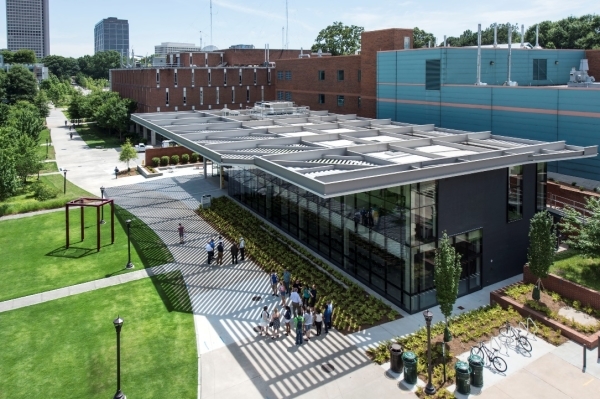 It will take place in one of the newest buildings on campus, the John and Joyce Caddell Building, which is an excellent example of adaptive reuse as a new classroom and faculty building adapted from a 1950s concrete and steel framed structure. 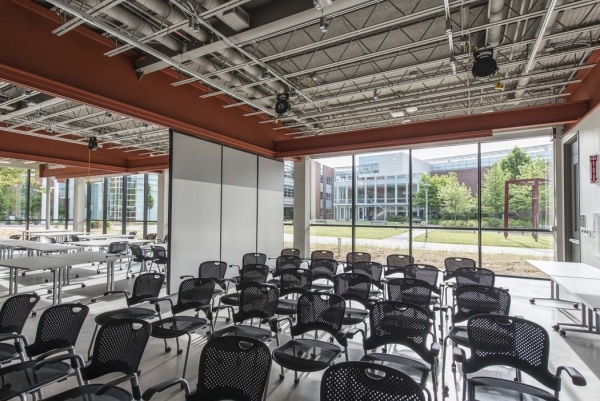 The exposed structure, heating and cooling systems, and real-time energy use boards serve as a learning environment for Building Construction students. The building houses the Caddell flex space, which is a digital collaboration space with reconfigurable classrooms. The School of Architecture can be found around the corner from the John and Joyce Caddell Building. Undergraduate architecture studios can be found in Architecture West, and Architecture East houses the Reinsch-Pierce Family Auditorium, and this will be the location for public keynote talks. 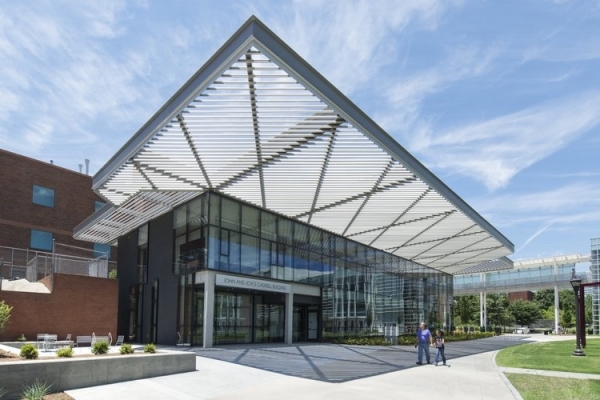 The Hinman Research Building, located across the street from Architecture East and West, is an award-winning facility that houses upperclassmen and graduate design studios, jury spaces, and research labs. The Georgia Tech campus is located in Midtown Atlanta. Atlanta is the capital and most populous city of the state of Georgia. With an estimated 2017 population of half a million people, it is the cultural and economic center of the Atlanta metropolitan area, home to 5.8 million people and the ninth-largest metropolitan area in the United States. Atlanta was founded as a transportation hub at the intersection of two railroad lines in 1837. During the 1960s, Atlanta became a major organizing center of the civil rights movement, with Dr. Martin Luther King Jr., Ralph David Abernathy, and many other locals playing major roles in the movement’s leadership. During the modern era, Atlanta has attained international prominence as a major air transportation hub, with Hartsfield–Jackson Atlanta International Airport being the world’s busiest airport by passenger traffic since 1998. Midtown Atlanta offers multiple accommodation options at walking distance or using the MARTA public transportation system. The conference has reserved a limited and generously discounted block of rooms for SimAUD presenters and attendees in the Georgia Tech Hotel and Conference Center, which is a 10-minute walk from the conference venue. Non-smoking King bedding accommodations have been blocked for this group. Please note that all guestrooms are non-smoking. For any other requests or inquiries, please enter this information within the appropriate request boxes during the reservations process or call the hotel directly by calling (800) 706-2899 or (404) 838-2100.